Young Customers choosing and buying floor covering in carpet store. Close up of a young Man buying floor covering in carpet store. Young man choosing and buying floor covering in carpet store. 1960 - Teenagers having a party and young children can create messes on rugs. Woman shopping for rugs for home department store. Shopping store hardware and department shopping. Products for home, business and construction.Large warehouse design. HD 1080 video. Don Despain of Rekindle Photo. Alley in Marrakech with beautiful rugs and artisan products for sale. Panoramic view across Marrakech with rugs hanging to air across rooftops. Morocco. Close up of a closing sale sign in the window of an old store which is going out of business. Carpets for sale hanging from building. Marrakech, Morocco. Panning shot across Vietnamese rural village property with rugs hanging on line & flag hung from roof. Children are preparing to participate in the tournament. In the hall there are weights near the rugs. Children are waiting for the start of the tournament. Weight-lifting. A medium panning shot of women weaving factory rugs. A full shot of two women weaving factory rugs. 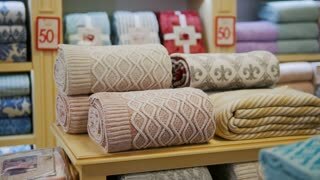 Beautiful attractive young woman selects rugs on the shelves in the store. Consumerism concept. 1960 - Rugs are cleaned at a professional cleaning plant. Detail of rugs underwater while being washed.